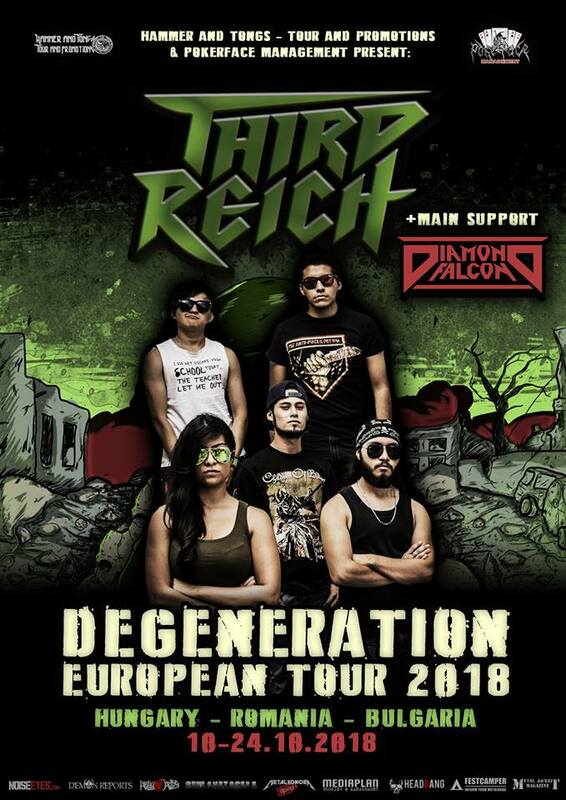 BORN NEAR SEPTEMBER 2014, INFLUENCED BY OLD SCHOOL THRASH METAL BANDS THIRD REICH HAS ACHIEVED TO GROW AMONG THE GREATEST BANDS IN MEXICO AND BECOME ONE OF THE BIGGEST PROMISES IN THE MEXICAN THRASH METAL SCENE. MAINLY INFLUENCED BY THRASH METAL BANDS FROM THE 80’S , THE BAND STARTS SEEKING ITS OWN PURE SOUND, AN AGGRESSIVE THRASH METAL WITH DEVASTATING RIFFS, REVEALING A MUSICAL INNOVATION, KEEPING AN UNBREAKABLE ATTITUDE ON SCENE THAT HAS CHARACTERIZED THE BAND THROUGH THE YEARS. LEAD BY MIGUEL ON VOCALS, ALEX ON BASS, DAVE ON DRUMS, FER ON GUITAR AND CHRISTIAN ON GUITAR, THIRD REICH HAS LEARNT THE IMPORTANCE OF BEING SELF-SUFFICIENT. ALWAYS KEEPING AN HONEST AND LIBERAL WAY OF THINKING, WITHOUT ANY DIVISION. HAVING SEVERAL LINE UP CHANGES DURING THIS TIME, THE BAND GOT CONSOLIDATED IN 2015 WITH FER ON GUITAR, DAVE ON DRUMS, CHRISTIAN ON GUITAR, MIGUEL ON VOCALS AND OSCAR ON BASS, WHO WOULD LATER BE REPLACED BY ALEX RESPECTIVELY. IN THIS YEAR, WITH A COMPLETE LINE UP, THIRD REICH RECORDS A FIRST E P CALLED “WAR REIGNS” AT BUNKER RECORDS, GETTING NOW A PLACE IN THE LOCAL AND NATIONAL SCENE, PLAYING OUT OF TOWN BECOMING ONE OF THE BIGGEST PROMISES IN THE MEXICAN THRASH METAL SCENE. BY THIS TIME, THE BAND STARTS SPREADING ITS MESSAGE THROUGH THE WEB, GETTING A CONSIDERABLE PLACE IN THE INTERNATIONAL SCENE,BEING HEARD IN OTHER COUNTRIES AS WELL, IN ADDITION, THE BAND RECORDED A LIVE SESSION VIDEO, OBTAINING A NOTORIOUS ACCEPTANCE IN THE SCENE. IN 2016, THE FORMER BASS PLAYER DECIDES TO LEAVE THE BAND DUE TO PERSONAL ISSUES AND NOT SHARING THE SAME INTERESTS THE BAND DOES, BY THIS TIME, ALEX DECIDES TO JOIN THE BAND AS THE NEW BASS PLAYER. AFTER SEVERAL MONTHS OF REHEARSING THIRD REICH RELEASES WHAT WOULD BE THE VERY FIRST FULL ALBUM TITLED “DEGENERATION” BY KUNAK RECORDS. WHICH HAS GIVEN THE BAND THE CHANCE TO KEEP ON SPREADING ITS MESSAGE , REACHING MORE AUDIENCE IN THE NATIONAL AND INTERNATIONAL SCENE, DEMONSTRATING THE MUSICAL QUALITY THE BAND CAN OFFER. THE BAND HAS ALSO TAKEN ITS SINGLE “WAR REIGNS” IN ORDER TO RECORD THE FIRST OFFICIAL LYRIC VIDEO. THIRD REICH IS NOW WORKING ON THE RECORDING OF ITS SECOND DISCOGRAPHIC MATERIAL WHICH IS GOING TO BE RELEASED ON JUNE 2018 AND IS GOING TO HAVE THE FIRST EUROPEAN TOUR ON OCTOBER 2018. EXPECTING TO REACH MORE EARS TO EXPLODE THEM WITH ITS AGGRESSIVE AND INNOVATIVE SOUND, POWERFUL RIFFS AND THE OUTSTANDING PERFORMANCE ON STAGE THAT CHARACTERIZED THE BAND DURING THIS TIME. The brothers Savage and Weazzel founded Diamond Falcon May 2012. After a short period of lineup-changes the band launched into touring the local Heavy Metal scene early 2013. Early gigs with SCREAMER, FREEDOM CALL, LORD VOLTURE, STRIKER, SKULL FIST, STEELWING, LIZZY BORDEN and BLAZE BAYLEY as well as an intense liveshow complemented by a unique style of humor including the much sought for, intelligent interaction with the crowd quickly gained DIAMOND FALCON a reputation as an energetic and original live act in the Austrian Heavy Metal underground and beyond. In 2017 DIAMOND FALCON were part of the Trveheim Vol. II lineup, sharing a stage with TYTAN, GRIM REAPER and CLOVEN HOOF. The first record HEAVY METAL COMBAT was released JAN 2014 independently and is available as a free download as well as shipping worldwide. The follow-up album FALCON’S REVENGE was released MAR 2017 and is of course available worldwide too.